Our Premium 50-Person Medical Trauma Kit with rolling duffle bag is ideal for the safety and emergency plan of any business, school or organization. This emergency medical kit exceeds ANSI Standard Z308.1.2009 for workplace minimum first aid supplies. This comprehensive 801-piece trauma kit was developed with the help and validation of nurses, EMT's and firefighters. 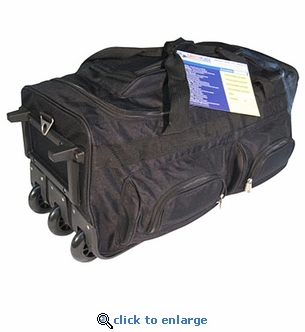 Packaged in a 30" heavy-duty red duffle bag on wheels, the kit includes the essentials supplies needed to perform first aid and triage in a major disaster or medical emergency. The picture shown is of our 100-Person Premium Trauma Kit. The 50-person kit contains the contents listed below. 5 Triangular Bandages w/ Clips 40"
5 Blood Stopping Compression Bandages 9" x 5 ½"
10 X-Large Fabric Knee Bandages 2" x 4 ½"
25 Butterfly Bandages Closure Medium 3/8" x 2"
2 Disposable Padded Splints 18"
5 Elastic Bandages 3" x 5 yds. 2 Paramedic Shears 7 ½"
5 Emergency Mylar Blankets 54" x 80"
2 Paramedic Yellow Blankets 54" x 80"
25 Cotton Tip Applicators 6"
Disposable Sterile Bulb Syringe 2 oz.